Nanaimo Bars, like Butter Tarts, are quintessentially Canadian. Everyone’s got a recipe for it that has been passed down from someone else and everybody loves them. And rightfully so! 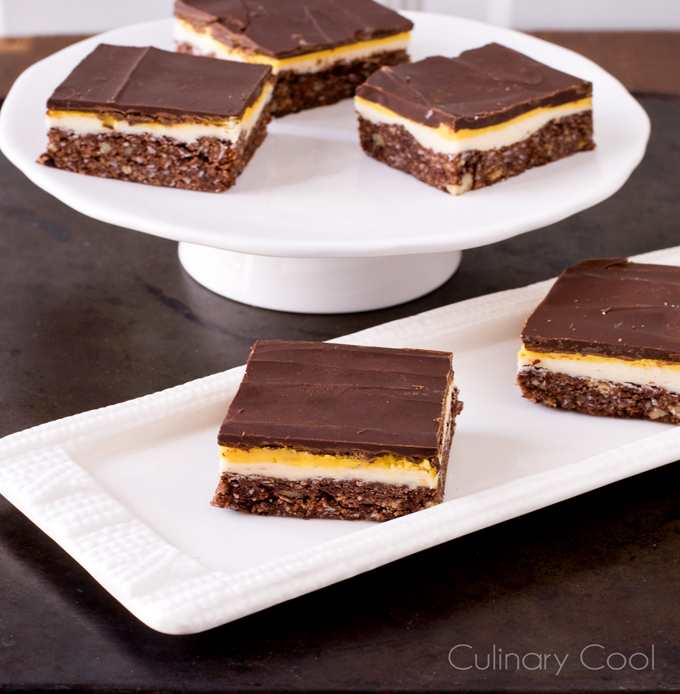 How can you resist a Nanaimo Bar? The base is similar to a brownie, only better (obviously) because it’s mixed with walnuts and coconut. It’s topped with a sweet vanilla custard and silky smooth chocolate. Pure, cavity creating, bliss. People love Nanaimo bars so much, that you can pretty much find a recipe for any flavor; peanut butter, mint, you name it, it’s out there. 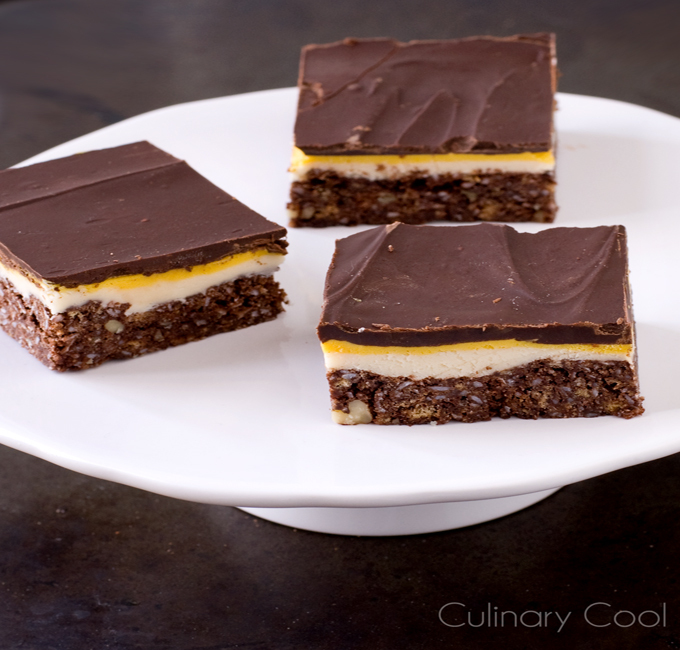 My take on the Nanaimo bar doesn’t change any of the classic elements. It’s the same flavor we all know and love. It still has the chocolaty and nutty base, silky smooth vanilla custard filling, and crisp chocolate topping. The only difference, is that I made it resemble a Cadbury Cream Egg which is fitting considering Easter is just around the corner. I got the idea to make it look like a cream egg from Love and Olive Oil. All you need to do is reserve about 1/3 the filling, dye it yellow and layer it on! Simple as that. You have an Easter version of the Canadian classic dessert. No matter how you spin it, Nanaimo Bars are perfect. This version of the classic Canadian treat is made to resemble a Cadbury Cream Egg, and is the perfect addition to your Easter celebrations. Line a 9-inch square metal cake pan with parchment paper. In bowl, stir together graham crumbs, coconut, walnuts, cocoa powder and sugar. Drizzle with butter and egg; stir until combined. Press crumb mixture into cake pan. Bake until firm, about 10 minutes. Let cool in pan on rack. In the bowl of a stand mixer, fitted with the paddle attachment, beat together butter, custard powder and vanilla. Beat in icing sugar alternately with milk until smooth, adding up to 1 tsp (5 mL) more milk if too thick to spread. Remove about 1/3 of the filling and add yellow food coloring. Mix to combine. Spread the 2/3 of the white filling on first and refrigerate for sbout 30 minutes. Spread the yellow filling on top of white filling. In heatproof bowl, microwave chocolate and butter. Spread over filling; refrigerate until almost set, about 30 minutes. With the tip of a knife, score into bars; refrigerate until chocolate is set, about 1 hour.